Poster for Romeo and Juliet performance in Moncton. Click photo for larger version. MONCTON, N.B. – For the first time ever, the Atlantic Ballet Theatre of Canada and Theatre New Brunswick (TNB), the province’s two largest performing arts organizations, are collaborating on a production that is sure to entertain and impress audiences with the staging of Shakespeare’s cherished love story of Romeo and Juliet. The production will combine ballet and the spoken word, a unique combination that is very exciting for both companies. 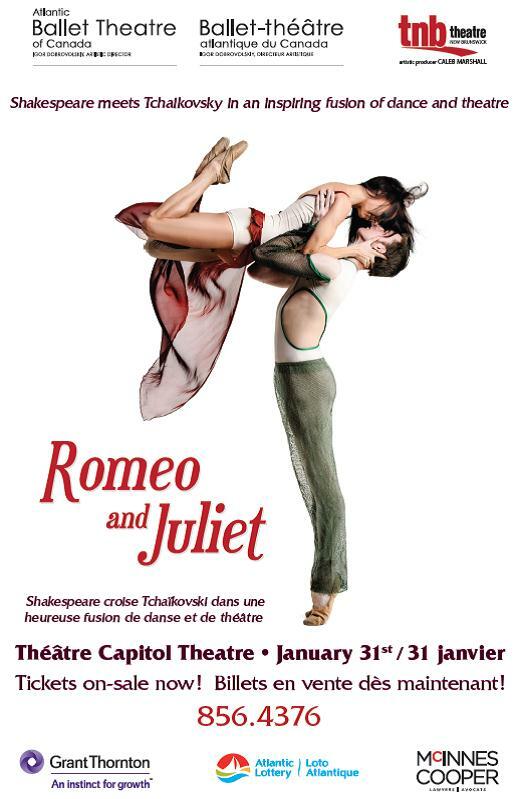 Romeo and Juliet will be performed on Thursday, Jan. 31, at 7:30 p.m. at the Capitol Theatre in Moncton, and on Saturday, Feb. 2, at 7:30 p.m. at The Fredericton Playhouse in Fredericton. Caleb Marshall, TNB’s Artistic Producer, will be in residence working with Atlantic Ballet Theater’s Artistic Director Igor Dobrovolskiy beginning Friday, Jan. 18, and for the two weeks leading up to opening night in Moncton. Part of this special production will include four actors who will be the voice of Shakespeare and provide a voice for the performance as it is set to dance. 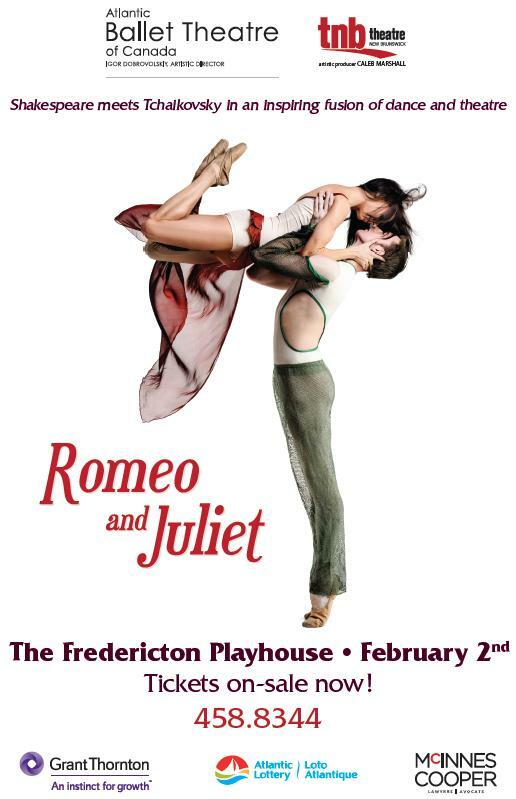 Poster for Romeo and Juliet performance in Fredericton. Click photo for larger version. As always, Atlantic Ballet Theatre dancers will bring brilliant technique and transforming characterization to the stage. Dancing the lead roles in Romeo and Juliet will be Leigh Alderson as Romeo and Janie Richard as Juliet. TNB’s acting company will include Cory O’Brien, who has performed at the prestigious Stratford Festival on a number of occasions; Ryan Field, an actor who has appeared in film, TV and also on stage at the Stratford Festival; and New Brunswick natives Martha Farrell (TNB’s The Gifts of the Magi, The Graduate, various Stratford Festival productions) and Wayne Best (TNB’s The Affections of May, various Stratford Festival productions, TV and film roles). This marks the second time that Marshall, Best and Farrell have worked together on Romeo and Juliet. They were part of the 2002 cast at the Stratford Festival. Other credits include: choreography – Igor Dobrovolskiy; adaptor and text coach (Artistic Producer of TNB creative collaborator) – Caleb Marshall; music – P.I. Tchaikovsky, J.S. Bach; costume design – Igor Dobrovolskiy, Norma Lachance; costume production – It’s a Stitch. Set on Tchaikovsky’s Fantasy Overture “Romeo and Juliet” and Symphony No. 4 in F Minor – Andante sostenuto, the ballet creates a world of caprice and uncertainty. Young lovers, face the consequences of feeling too deeply in a world where there is no clemency for breaking rules. Thursday, Jan. 31, in Moncton: Tickets available at the Capitol Theatre box office, 811 Main Street, Monday to Friday from 10 a.m. to 5 p.m. and Saturday from 10 a.m. to 2 p.m., and on Jan. 31 from 10 a.m. until show time at 7:30 p.m. Also available online at www.capitol.nb.ca and by telephone at 506-856-4379. Saturday, Feb. 2, in Fredericton: Tickets available at The Fredericton Playhouse box office, 686 Queen Street, Monday to Friday from 10 a.m. to 6 p.m. and on Feb. 2 from 3:30 p.m. until show time at 7:30 p.m. Also available online at www.theplayhouse.ca and by telephone at 506-458-8344. Atlantic Ballet Theatre of Canada is a neo-classical ballet company dedicated to performing original works by choreographer Igor Dobrovolskiy, also Artistic Director at Atlantic Ballet Theatre. Founded in 2001 by Mr. Dobrovolskiy and CEO Susan Chalmers-Gauvin, the company pursues a continuous creative process through collaboration with like-minded artists attracted by the vision and artistic philosophy of its Artistic Director. The company has performed throughout Canada, as well as in the United States, Belgium, Switzerland, France and Germany. For more information on the company, visit their website at www.atlanticballet.ca. Theatre New Brunswick (TNB) is one of Canada’s oldest and longest running regional theatre companies. TNB’s mission is to create extraordinary theatre that inspires and entertains audiences while celebrating New Brunswick’s best theatre content and artists; and to provide outstanding theatre training and performance that educates and awakens the imaginations of New Brunswick’s youth and emerging artists. For more information on the company, visit their website at www.tnb.nb.ca.